Albuquerque, New Mexico is a great city. It has semi-desert weather, a prominence of pueblo-style architecture, and is situated in a valley between several towering mountain ranges. We even happened to see a few prairie dogs ambling around in the bushes on one of the interstate off-ramps. Albuquerque’s road system is also very nice. Traffic was a bit congested and it’s a large enough city that getting from one side of town to another can take a considerable amount of time. But at least their interstates and major roads have nice landscaping and are painted with pictures and colors to match Albuquerque’s general theme. Albuquerque also has a great downtown scene. On a Tuesday night, their downtown was bustling with people and was full of quaint restaurants and busy clubs and bars. There is a lot to do in Albuquerque if you’re just interested in city life. But if you’re interested in a bit more than city life, about 10-20 minutes northwest of Albuquerque is located the Petroglyph National Monument. It’s known for its lava boulders, dormant volcanoes, and especially for the markings left behind by the early inhabitants of this part of the southwest. The park is divided into several sections, each accessed by a public road: the Visitor Center, Rinconada Canyon, Boca Negra Canyon, and the Piedras Marcadas Canyon as well as a few of the hills behind these formations where the ancient volcanoes are located. The Visitor Center is right in the middle of all of these and contains examples of the petroglyphs and several models pertaining to the history and geology of the area. It is a good resource for maps of the area, educational books and souvenirs. Of course, there are also Park Rangers at the Visitor Center who are available to answer any questions and give you a little more information about the petroglyphs and natural surroundings. The two main areas of interest to the casual visitor at the Petroglyph National Monument are the Rinconada Canyon with a 2 ½ mile unpaved round-trip trail and the Boca Negra Canyon with three partly paved trails that each take anywhere from 5 to 30 minutes depending on how much you want to see. The Park Ranger told us the Rinconada Canyon had more petroglyphs and was a better experience since it was more isolated and not as crowded as the popular Boca Negra Canyon trails. In the park, the petroglyphs are all found on the volcanic rocks, most in valleys, that in the distant path came from the volcanoes up on the ridge. (That’s where the name petroglyph comes from, “rock-picture”.) The petroglyphs range from human-like figures and animals to geometrical designs. Archaeologists believe that most of the petroglyphs in Petroglyph Natinoal Monument are between four to seven hundred years old. Though most of them were made by the Puebloan Indians, some were made by early Spanish and Mexican settlers of the region. Most of the meaning of the petroglyphs is lost on us today, but they are speculated to vary between territorial markings, spiritual symbols, and histories. 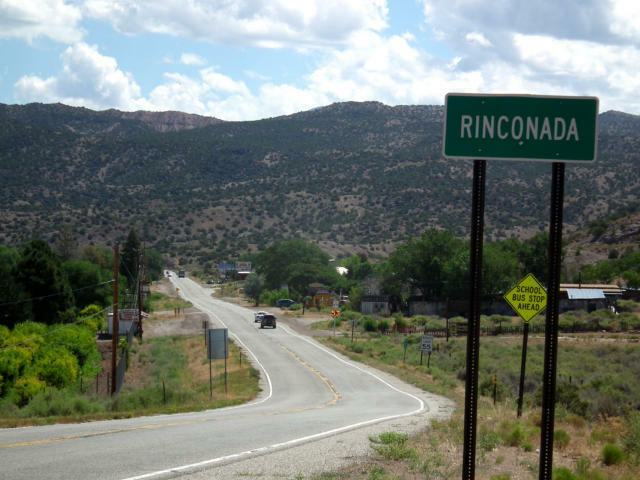 Well, we soon found out why Rinconada Canyon is the less-frequented of the two major areas. The 2 ½ mile trail wasn’t daunting to us because it was mainly flat with only a few small hills to climb and although it wasn’t paved, the dirt path was well-worn and easy to follow. What was disappointing is that the “hundreds” of petroglyphs that should have been easy to find were anything but. Most of them were worn down to the point of being illegible, quite a few were defaced with graffiti, and for some of them you had to climb high up on the hillside and look at the backsides of the boulders to find them. That got annoying after a while because even when you made the climb and if you were lucky enough to find something, it was still often so faint that it was a struggle to make out even the general shape. We went about halfway around this trail and according to the trail map we should have seen most of the major petroglyphs by that point, but only saw a few that were interesting at all. 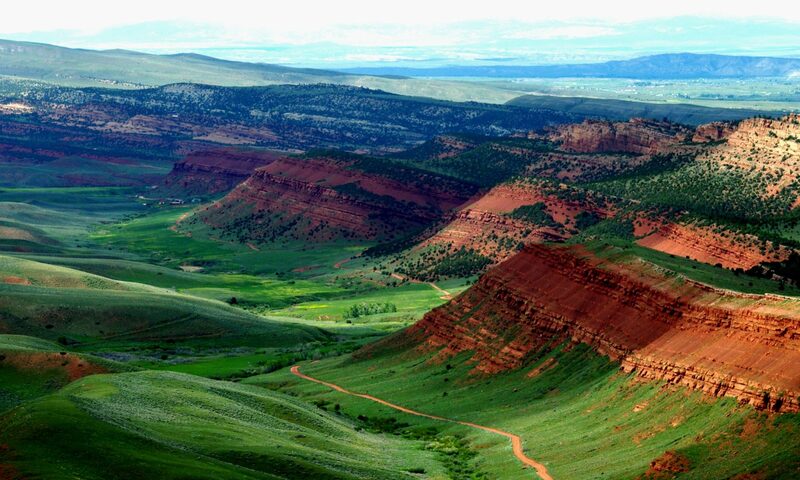 The environment was neat with small rolling hills of light green prairie grass surrounded by the canyon walls covered in black volcanic rocks. We only saw two other people on this path, so the sense of exploration was much higher. What wasn’t high was the sense of discovery, since everything we found was almost not worth finding. We decided to head back and check out the Boca Negra Canyon instead of giving up on the park. And we soon found out why this is the most popular one. Right at the start of each of the trails were very clear and easy to see petroglyphs. Most of these rocks had several decorations on them and were still in good shape and not weathered down like the petroglyphs of Rinconada Canyon. We hiked up to the top of a hill following a path in Boca Negra Canyon and saw both a nice view of the area from the top and quite a few well-defined petroglyphs right off to the side of the trail. It is true that the Boca Negra Canyon was much more crowded. Anyone who wants to enjoy nature or even feel like they’re exploring on their own gets disheartened at the crowd, especially when the crowd usually includes quite a few kids pushing and shoving and shouting. Nonetheless, this is obviously where the best petroglyphs are and it is definitely what makes the Petroglyph National Monument enjoyable. Overall, this is a nice place to stop if you’re in the area of Albuquerque, New Mexico. I wouldn’t go out of my way to see it if you aren’t, because we soon learned that petroglyphs are all over the southwest and almost any national park will have their own that are easy to locate and sometimes just as prominent or more so than the ones here at Petroglyph National Monument. Petroglyph National Monument is a good choice because it’s free in Rinconada Canyon or just to go hiking in and only costs $2 for parking at the Boca Negra Canyon area. It’s also unique in that you can explore the petroglyphs on your own. Other national parks have them fenced off and don’t allow you to get close like you can here. One thing to make sure of: don’t touch them! Being touched by too many people over the years can wear them away and eventually there’d be nothing left to enjoy. So, enjoy the petroglyphs, enjoy the area, but leave them the way they are. If you’re near Albuquerque and want a break from the city life, take 30 minute to an hour out of your day to learn more about the history of the United States and enjoy the fascinating people that have come before us.